Plan with anticipation your summer vacation in our Resort and get up to 56% OFF your reservation. Travel anytime from June 8th to September 20th! 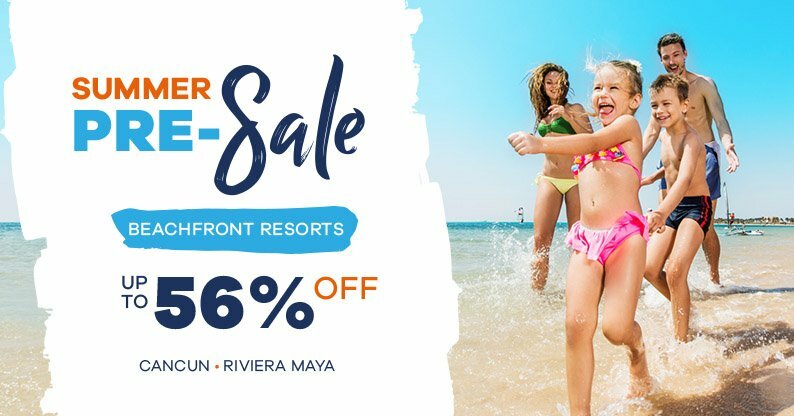 Take advantage of this special presale summer offer with the best prices here -in our resort official site- and receive the incredible benefit that we have for you at the reach of your hand with our special discount of up to 56% on your reservation. You will be staying in our beachfront resort with exclusive amenities and unparalleled services, offered in any of our plans: All Inclusive or Accommodation Only. Book now and travel during summer anytime from June 8th to September 20th! Tour Credit: The Tour Credit must not be considered as cash money. Is per reservation and it can only be redeemed at the Thomas More Travel Agency desk. Children stay Free: Children up to 12 years old can stay for free using the existing beds, there is no extra beds or rollaway beds available. Restrictions:The minimum lenght of stay is 4 nights, however this may vary depending on the season. "The Royal Cancun Resort was great! Great service, food, lodging. The resort is clean, beautiful and the staff is very friendly! I would like to give a special thanks to Eder Cupul! Eder went out of his way to make sure my stay was enjoyable and made me feel like I was at home! Thank you Eder!" "Great hotel if you are looking for a more quiet and peaceful atmosphere. Enjoyed that fact that it was all inclusive. This really helped those mornings when we had scheduled tours. " "A great non-inclusive resort. Close to the airport. Friendly staff, nice facilities, full kitchen with grocery store on the premises. Took our own drinks to the pool and cooked our own breakfast. Would love to go back!"